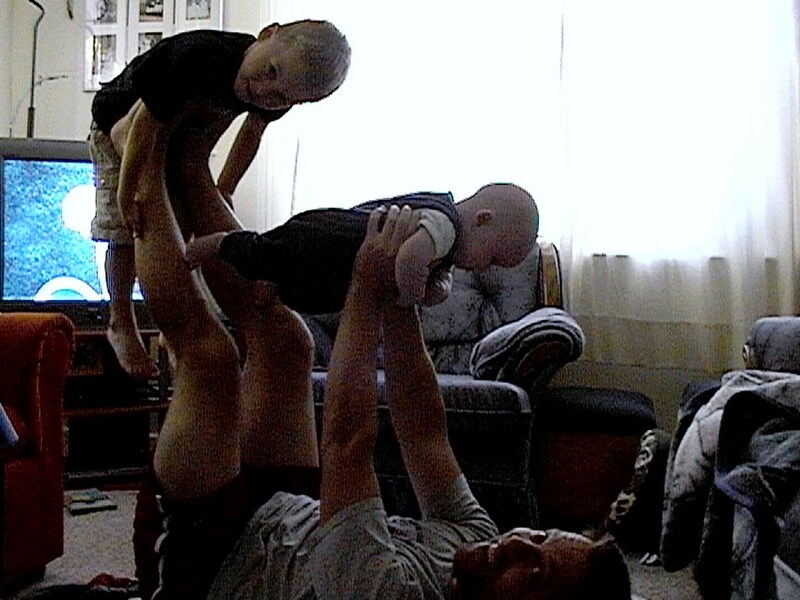 Our living room has always been a family gathering place. 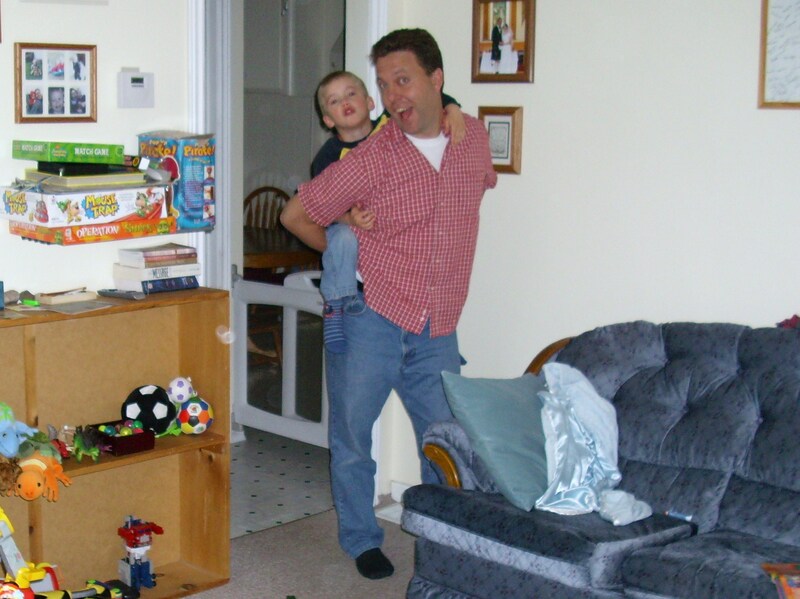 As I was going through pictures to add to this post, I was captured in my memories for a while. I’m just going to focus on the process of the renovations in these posts, but as I looked through the years on film I realized a house does not make a home. Truly a home is made by the ones who dwell within the walls of the house and how they interact with one another. Dreams are formed, families built, fun abounds, learning awaits – all of it comes together no matter how much space you have or how old your house may or may not be. Most of my fondest memories of our early days in this house were made in the living room. Watching the boys grow, playing with them, laughing with them, talking with them. Elijah’s first nights at home, in my arms in the recliner in the living room. Then his first words, first crawl, first skip and jump. Many illnesses endured on the couch, many sunny days playing at being a cat curled up in the sunlight streaming in the windows. But I digress… on to the renovation photos and I’ll keep my memories for the family scrapbook and maybe share them with you another day? Hopefully these two pictures give you a tiny example of what our living room used to look like. There was a side door in this room, so in the winter we moved the furniture in a bit and part of the living room behind the couch became an entranceway where we also hung our coats and put our shoes and boots. 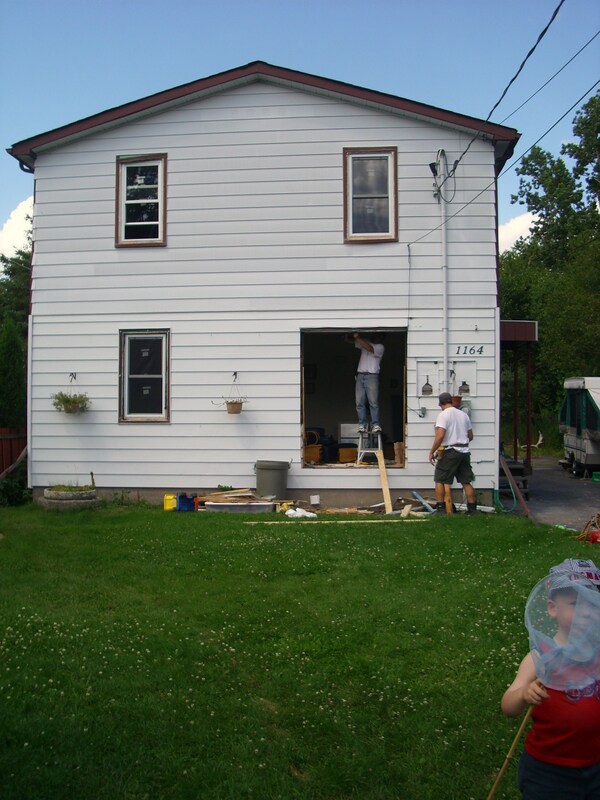 In the summer we had the whole room to use because we could re-open the back porch – the porch wasn’t winterized in the least and just didn’t cut it during the winter, so we would seal it up every year and hope no drafts came into the kitchen! 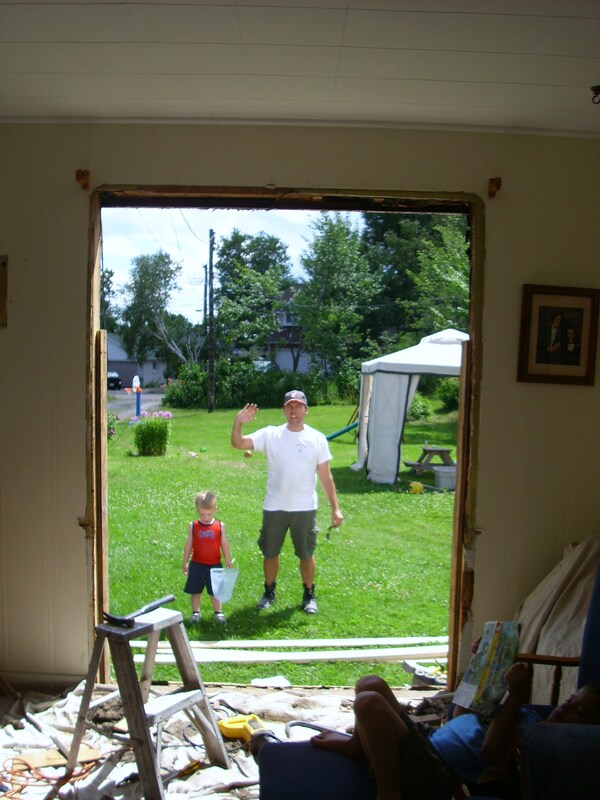 Here’s a view out the front living room window before it became a double door! 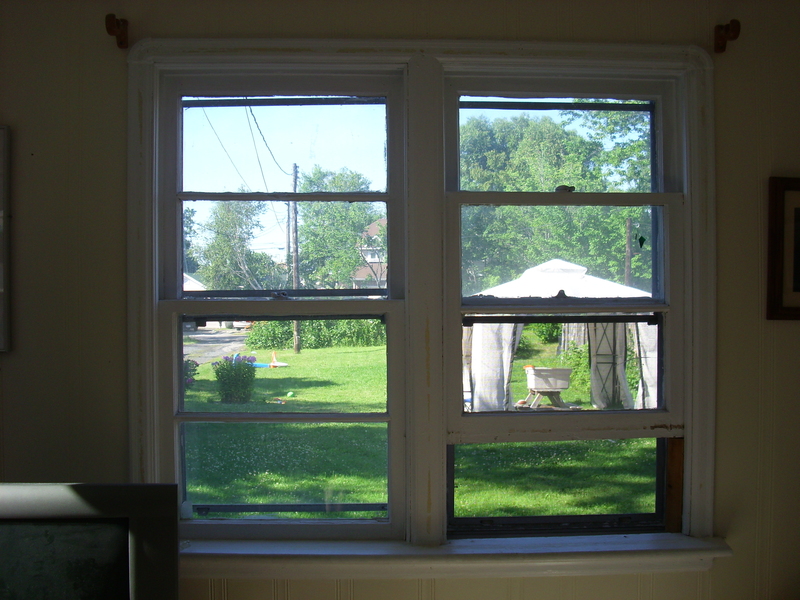 The windows used to have wood frames and huge windowsills which sadly couldn’t be salvaged. 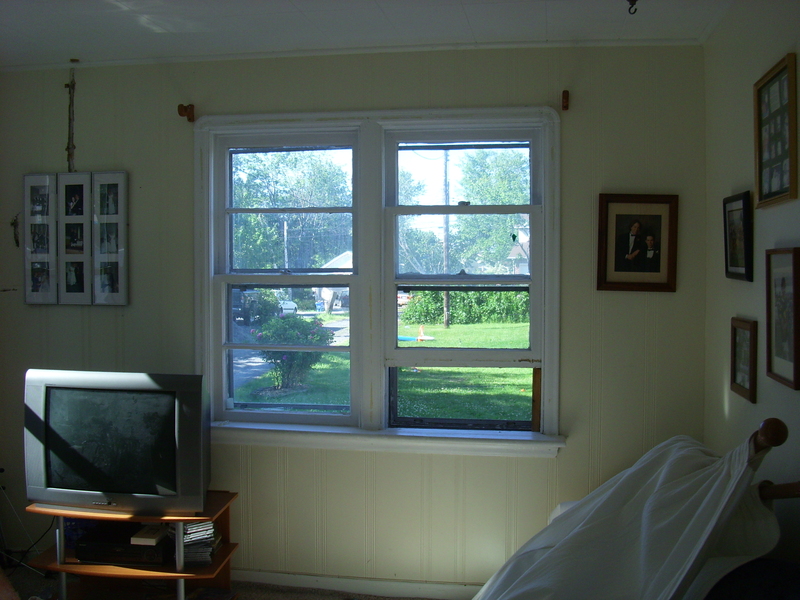 The old windows were impossible to open and close from multiple layers of paint and years of expanding and retracting in the northern climate. This window isn’t propped open with anything and yet it’s staying open by itself – not safe for little hands! 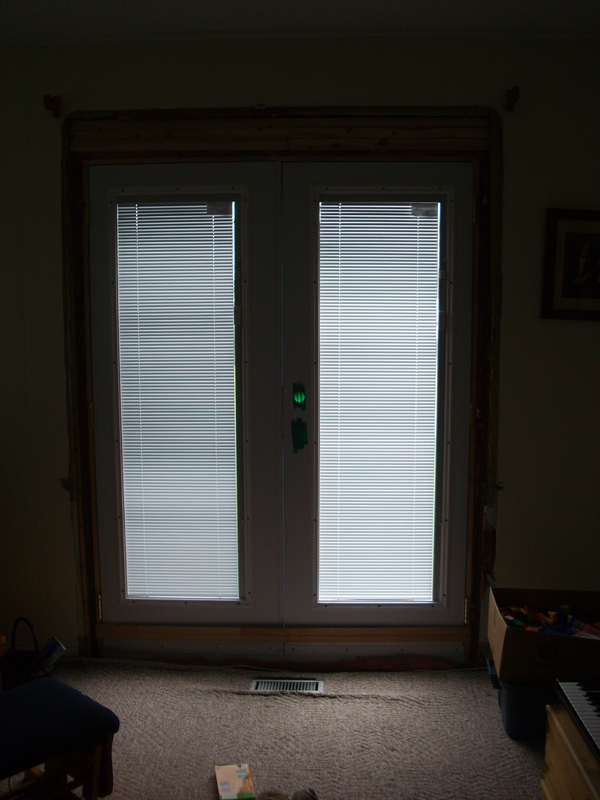 Here’s the same view from the newly-cut opening for the double doors which were installed the same day. Wave to Josh and Elijah! Josiah is calmly reading on the couch – he wasn’t phased by much at all during the renovations – he amazed me time and again and I tried to learn from his example! 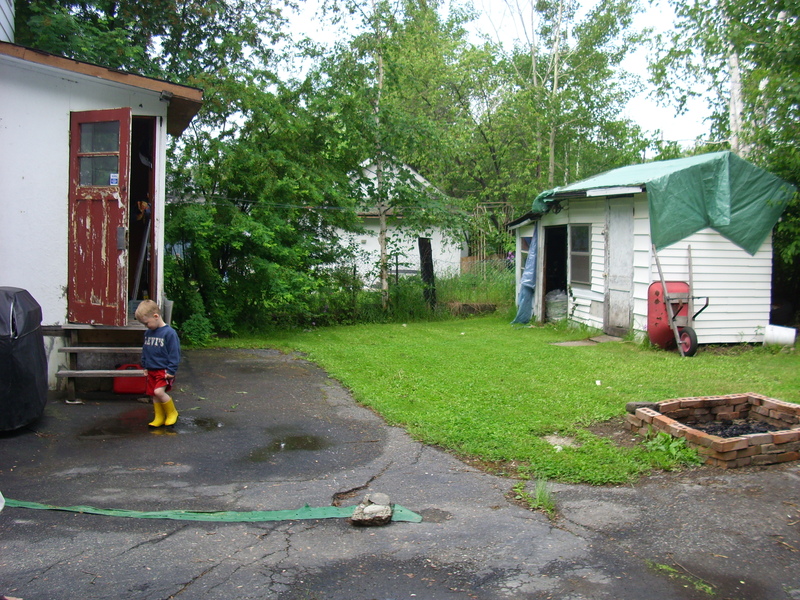 View of the opening from the yard – Elijah and I are trying to catch butterflies. New door installed! Now we just need a door knob. Ooops! Forgot about that. 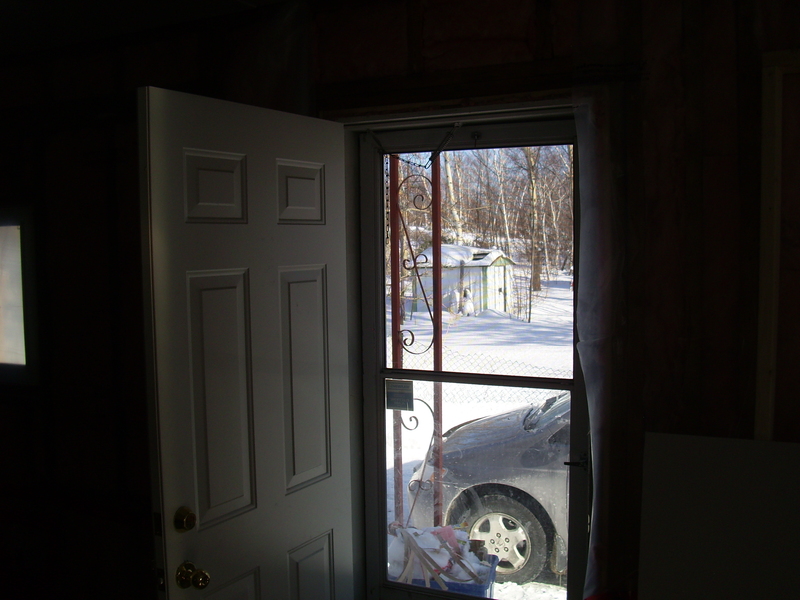 This was the old side door that we used during the winter and closed up during the summer. I found this photo of the back porch – this gives you a glimpse of why we couldn’t use it during the winter months – it was just too run-down. 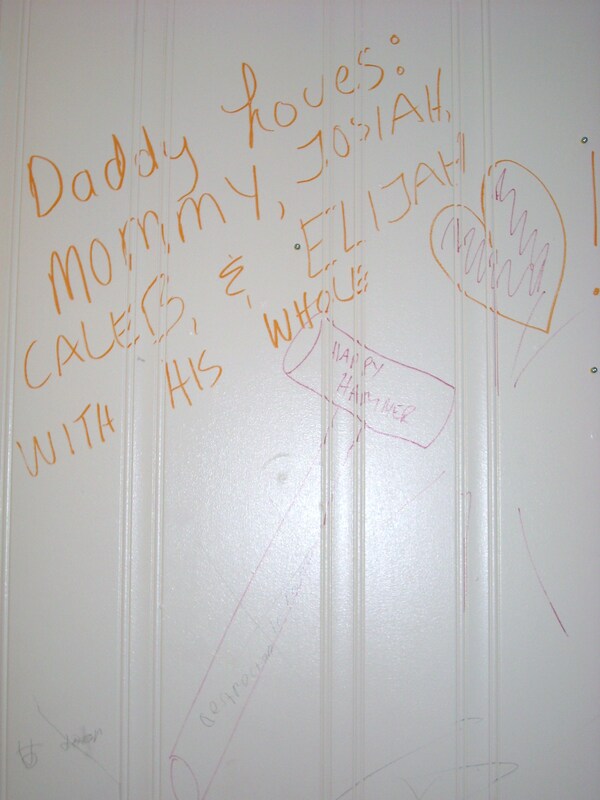 Josh wrote some interesting things all over the house during the renovations. 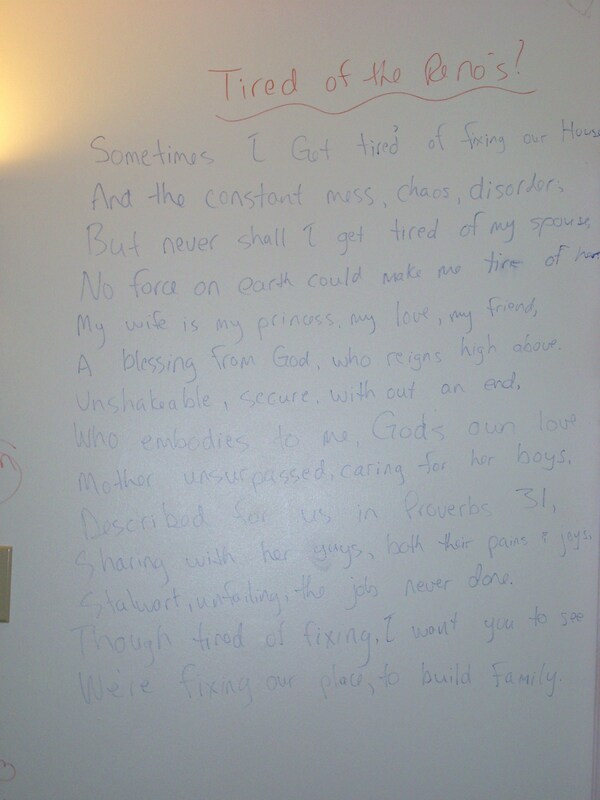 On the old living room walls he wrote a poem called Tired of the Renos? I did a separate post for that! And here’s a funny picture he drew of the Happy Hammer which would soon be demolishing the panelled walls of our old living room. He also wrote out his love for his family which is always appreciated! 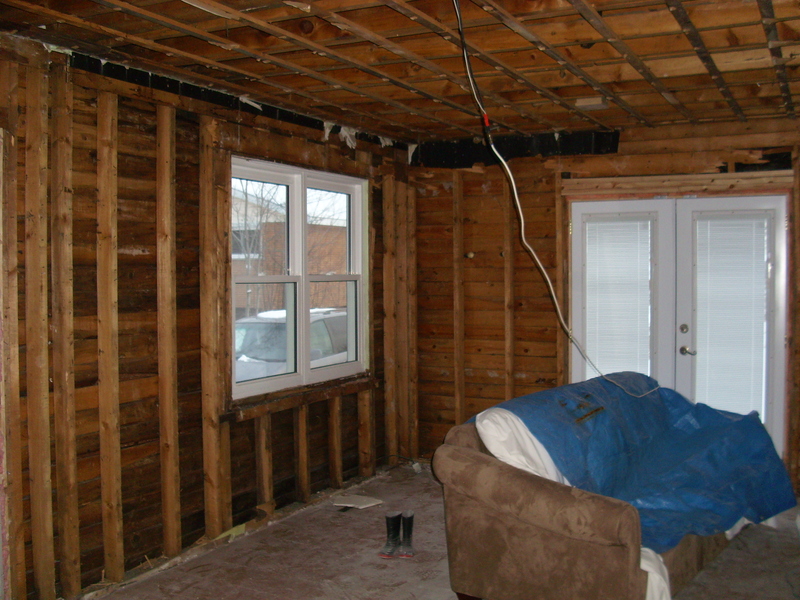 And here’s the demolished living room a few weeks later! The couch had to stay put and got covered with sheets during the remainder of the main floor renovations. 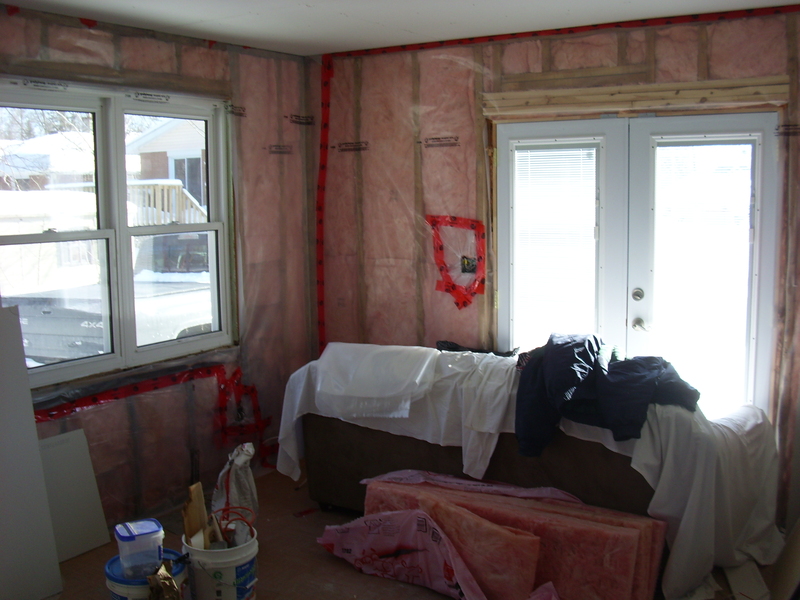 All insulated and ready for drywall. This was done during another time we were away for family vacation. Fast forward almost two years and we were into the fall of 2010. The upstairs floor was getting trim and floors done so we were back to living on one floor while the other was getting renovated. The boys slept in the living room for about a month while Josh and I slept in the den. It went so well, actually, and we had a lot of fun curling up together on these mattresses – reading, talking, wrestling. The boys also enjoyed making really cool forts from all the pillows and blankets available to them! 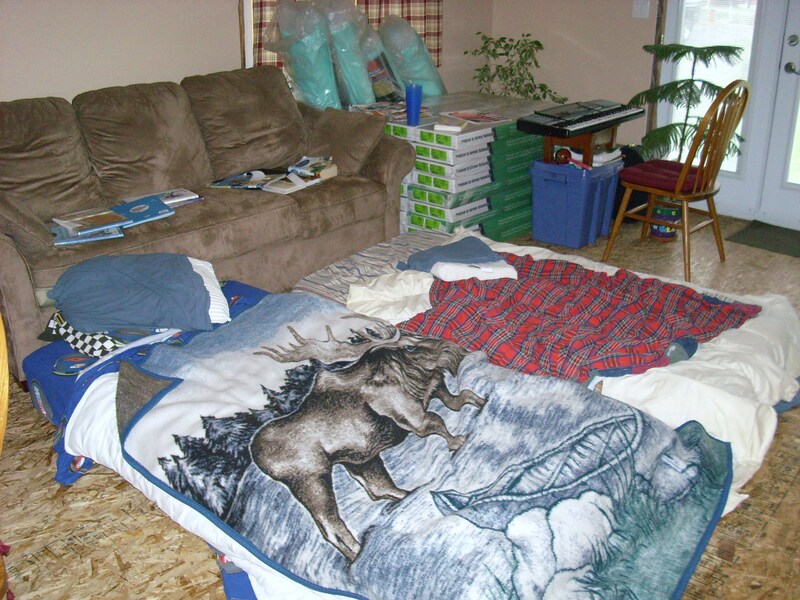 After that month we were back to sleeping upstairs and it was time to floor and trim the main floor. The tools and materials found a new home in the living room for a while. 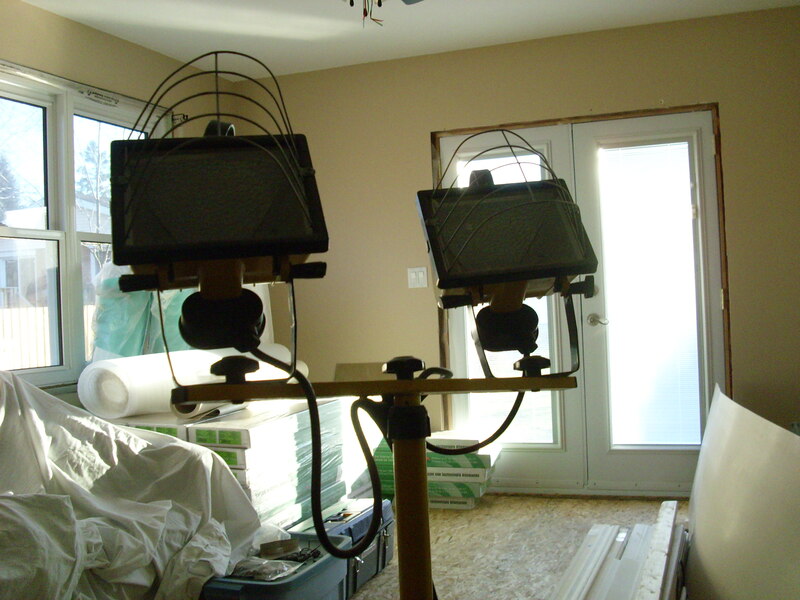 We hired a great contractor to help us with the finishing jobs – one reason is because we were totally burnt out from the renovations by this point and couldn’t think about lifting another hammer! Another reason is this was the “prettying-it-up” phase and neither one of us has had quite enough practice to attempt flooring and trimming a whole house. 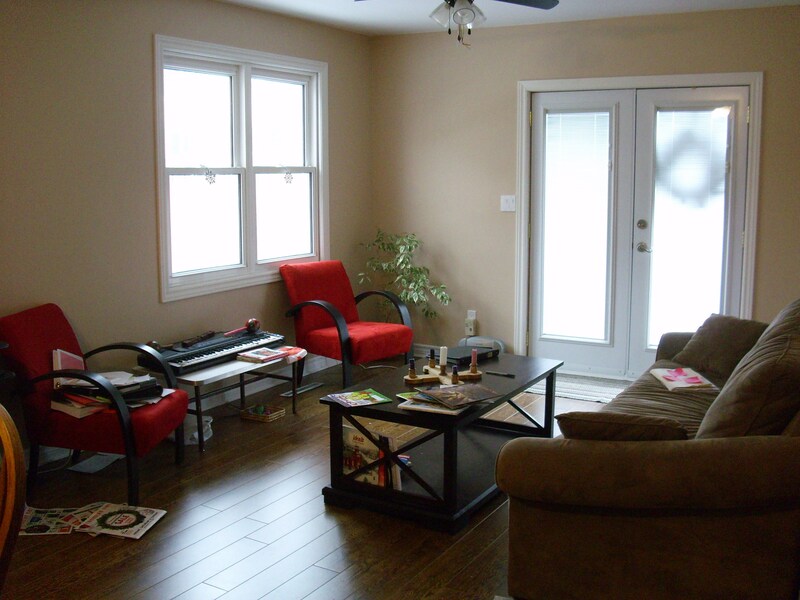 And here it is… the finshed living room! We bought a couple of new chairs and it’s really looking awesome! We were glad to have the space back just in time for Advent!